In the state budget Gov. Jerry Brown just signed there's a big win for the arts, and specifically the California Arts Council: $6.8 million permanently added to the agency's budget. At a time when federal funding for the arts is in jeopardy, the state agency can count on a bigger pot of money to support a wide variety of arts programs all over California. It's also a sign that state legislators have reprioritized arts funding after years of dedicating little money to the council. The National Assembly of State Arts Agencies ranks states according to arts funding in four different ways, but in terms of total state agency spending, California ranks 40th out of 50 states in per-capita funding, based on this fiscal year. The ranking based on this latest budget hasn't been released yet. "We are thrilled," Brad Erickson, Executive Director of Theatre Bay Area, said. He's followed budget negotiations closely over the years, and in the past, he's criticized state government for one-time budget boosts that leave the council and its grantees in a state of suspense about the future of programs. The Governor, Erickson says, "has set an new baseline for its future funding." "What this really means is that the excellent programs begun last year with these funds will continue," Erickson added. Tamara Alvarado heads the School of Arts & Culture at San Jose’s Mexican Heritage Plaza, which provides "high quality arts education primarily through mariachi music and Mexican folkloric dance.” The School is getting two grants this fiscal year, worth roughly $170,000, for arts education and creative place-making in San Jose. "In this time when the NEA is on the chopping block, I am pleased to see the Governor sign on to a budget that includes permanent funding. It tells me that the Governor understands and supports the concept and practice of every Californian having access to creativity and art," Alvarado said. The California Arts Council budget also includes an additional $750,000 ongoing allocation to support increased arts programming for youth engaged in the juvenile justice system, as well as an additional $2 million increased allocation for California's Arts in Corrections program. And then there's approximately $1.1 million in annual federal support from the National Endowment for the Arts in the council's budget, and approximately $2.5 million in annual funds from sales and renewals of California's Arts License Plate and voluntary state tax return contributions to the Keep Arts in Schools Fund. Altogether, the Arts Council's total 2017-18 budget will be approximately $19.48 million, plus an additional, separate $8 million state allocation for Arts in Corrections. "We are grateful to Governor Brown and our state legislators for their belief in the power of the arts to enrich our lives and foster safe, healthy, and vibrant California communities," Donn Harris, California Arts Council Chair, is quoted saying in the agency's press release. 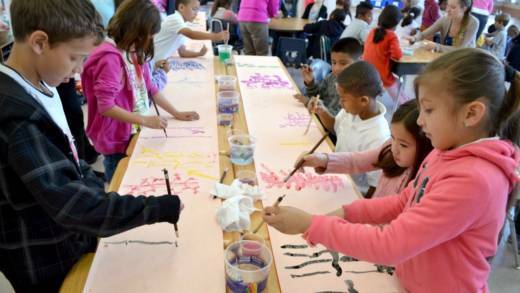 "The state's increased investment in culture and creative expression has helped to grow arts programs benefitting Californians at all levels of society, and demonstrates clearly who we are and what we value as a state."